I’ve never had a green thumb. Especially when it comes to keeping indoor plants alive. I don’t think I’ve ever managed to keep one alive for more than a year. Until now. I don’t attribute this shift in plant lifespan to my gardening skills whatsoever, it’s all house. 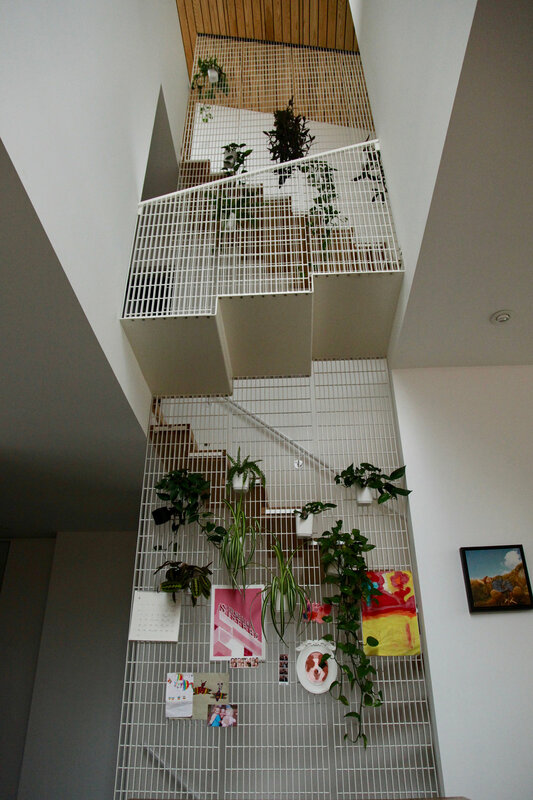 Plants love this house, which is awesome/imperative, because we always envisioned it bursting with greenery. 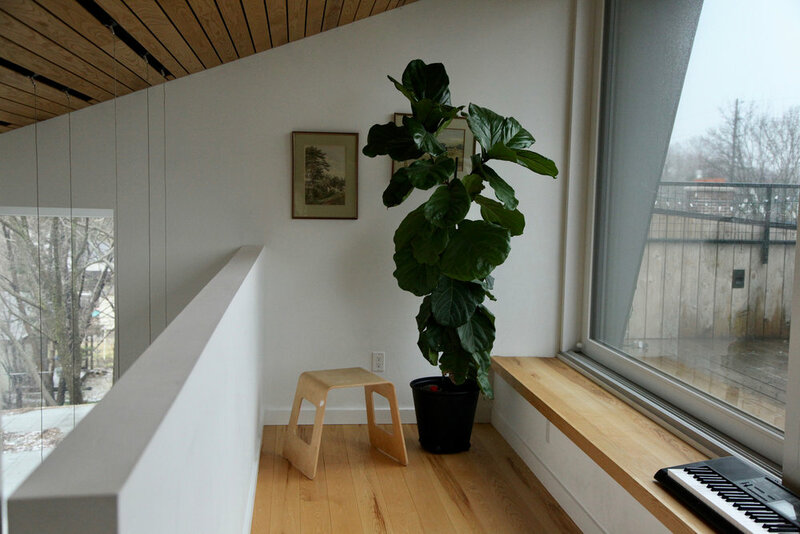 There is so much natural light, both direct and indirect, that no matter where we put our plants, they seem to be happy. 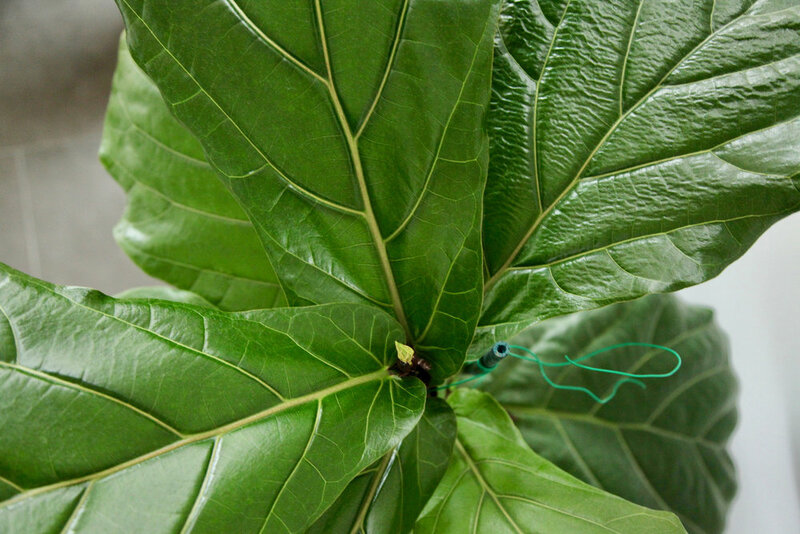 Almost one year ago, I bought a fiddle-leaf fig. A beautiful, but notoriously difficult plant to care for. I bought a ‘bush’ plant, but what I wanted was a ‘tree’. Taking a chance, I separated the bush, which had three stalks, into three separate pots. (Actually my wonderful sister Lindsay helped me with this arduous task). And they’ve each grown over 2’ since, in different locations and orientations throughout the house. They’ve continually produced new leaves throughout the winter, even though they’re supposedly in their dormancy period. An emerging leaf set -- hello! 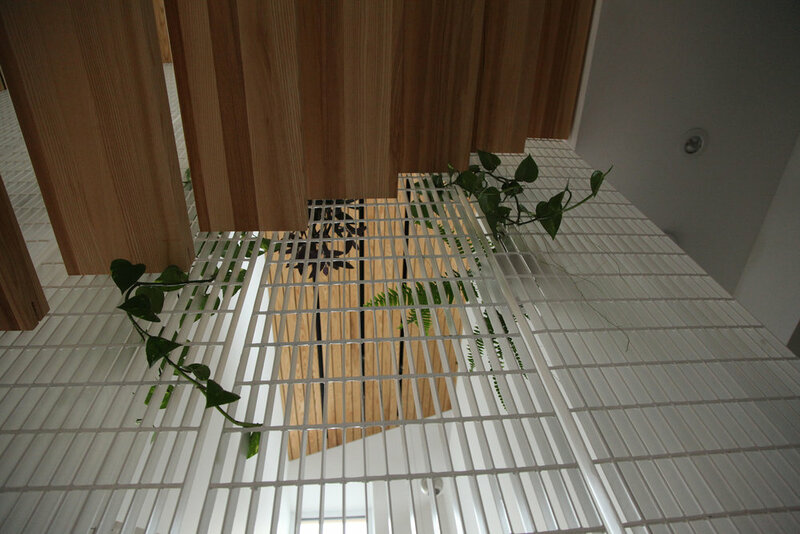 From the outset of the design, we liked the idea of having a green wall within our courtyard/void. It made sense that this green wall would live on our stair screenwall (the wall that supports our stairs and is made from industrial steel floor grating). But I’m not a fan of most indoor green walls I see. They require a lot of maintenance and can create a lot of mess. No thanks. For a long time, I wondered what to do. I scoured the internet and plant shops looking for appropriate wall containers, but didn’t see any I liked, at the right price. Then one day, on a routine Ikea run, the lightbulb went off in the kitchen markethall. Hanging utensil holders. At $3.99 a pop, I bought a few to test out at home. They easily hooked onto our screen wall, and had a metal grate in the bottom that left some breathing room for roots. It was a winning solution. We now have a multitude of plants and pots scattered across our screen wall. Some cheekily poking through the other side. And we’re only getting started. Best part: I’m only watering once a week. And I can easily water them from the stair side, with no need to get up on stools. Bonus feature of our screenwall: it's magnetic. It has also become wall for magnets, to display the hordes of art and photos we have of the fam. Greetings! From plants as you cross the bridge. Stair side view, with leaves poking through. I am enjoying learning to care for these plants, in the lowest maintenance way possible, even if the house is doing most of the work. The indoor plants make it come alive, and help it to feel more vibrant, especially on days we’re cooped up inside over winter ice storms and such. They also make our Passive House fresh air, even fresher. *Knock wood*, but there were no sickies in our house this winter save for a few short-lived runny noses.